You’re pregnant! Pregnancy is that exciting time to enjoy your baby in your belly. Over the next 9 months, your baby will be growing and nurtured by both your physical and mental well-being. Pregnancy can bring you that motherly glow, but it can blossom some minor frustrations like stretch marks. We know you want to do the best for you and your baby so Dr. Amy and the Baby Pibu team share two primary tips on how to prevent stretch marks during pregnancy. Stretch marks during pregnancy are known as striae gravidarum and affect 50 to 90% of pregnant women. Stretch marks appear as those unwanted red, thin lines on pregnant bellies, thighs, and breasts. When there is rapid growth, the elastin in our skin can be stressed and broken. This broken elastin tissue is what creates the stretch marks. Some risk factors include the extra hormones of pregnancy, family history, prior history of stretch marks, and single or multiple births. Now that you know what stretch marks are, what can you do to prevent stretch marks during pregnancy? Here are two primary tips shared by Dr. Amy and the Baby Pibu team. Eat healthy and be healthy! Nurture you and your baby with a healthy diet that includes a variety of foods. This variety of healthy foods include fruit for your vitamin C, spinach and vegetables for your iron and other vitamins, whole grains for your fiber, and dairy for your calcium. Don’t forget to take your prenatal vitamin daily as well to make sure you are getting the essentials like folate. We may be excited to be pregnant because we look forward to eating more. Watch the amount! Eating too much can lead to excess or rapid weight gain, which can increase your risk of stretch marks as well as more concerning health issues like gestational diabetes. 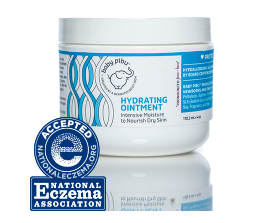 Try Baby Pibu’s Hydrating Ointment to keep that growing belly moisturized. Moisturize and massage your skin. Specific oils and creams marketed to prevent stretch marks during pregnancy are not guaranteed to prevent stretch marks during pregnancy. Even though moisturizing your pregnant belly may not ultimately prevent stretch marks during pregnancy, it is a great thing to do to keep your skin healthy, happy, and less irritated. Less irritated skin means less inflammation, and less inflammation means a reduced chance of broken elastin that leads to stretch marks. Massaging a cream or ointment on your pregnant belly is a great way to soothe your skin and create some relaxation for you and your baby. Don’t worry if stretch marks develop. Stretch marks may occur no matter what you do to try and prevent them. If stretch marks occur, see your dermatologist after you have your baby. Laser can be done to reduce the redness in stretch marks, and prescription topical medications like a retinoid can help repair the elastin and collagen in stretch marks.